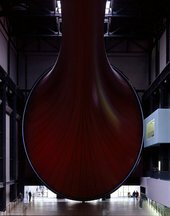 Anish Kapoor has undertaken the third in The Unilever Series of commissions for the Turbine Hall at Tate Modern. 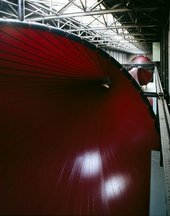 Anish Kapoor is renowned for his enigmatic sculptural forms that permeate physical and psychological space. 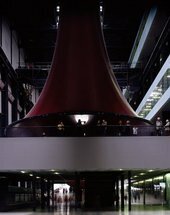 Kapoor's inventiveness and versatility have resulted in works ranging from powdered pigment sculptures and site-specific interventions on wall or floor, to gigantic installations both in and outdoors. 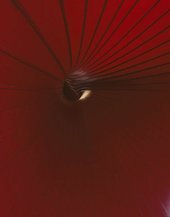 Throughout, he has explored what he sees as deep-rooted metaphysical polarities: presence and absence, being and non-being, place and non-place and the solid and the intangible. 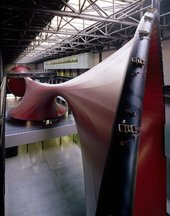 Marsyas, Anish Kapoor’s sculpture for the Turbine Hall, comprises three steel rings joined together by a single span of PVC membrane. Two are positioned vertically, at each end of the space, while a third is suspended parallel with the bridge. Seemingly wedged into place, the geometry generated by these three rigid steel structures determines the sculpture’s overall form, a shift from vertical to horizontal and back to vertical again. 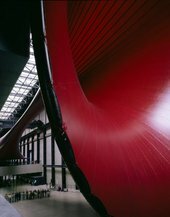 Kapoor began the project in January 2002, soon realising that the only way he could challenge the daunting height of the Turbine Hall was, paradoxically, to use its length. He approached the space as a rectangular box with a shelf (the bridge) in the middle of it, and over many months, explored its potential through a series of drawings and sculptural maquettes. Human scale and the relationship of the viewer to the work was central to his thinking. 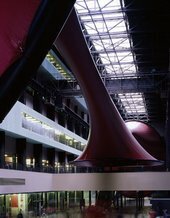 The PVC membrane has a fleshy quality, which Kapoor describes as being ‘rather like a flayed skin'. The title refers to Marsyas, a satyr in Greek mythology, who was flayed alive by the god Apollo. 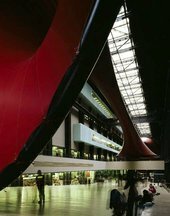 The sculpture’s dark red colour suggests something ‘of the physical, of the earthly, of the bodily.’ Kapoor has commented, ‘I want to make body into sky'. Marsyas confounds spatial perception, immersing the viewer in a monochromatic field of colour. It is impossible to view the entire sculpture from any one position. Instead we experience it as a series of discrete encounters, in which we are left to construct the whole. 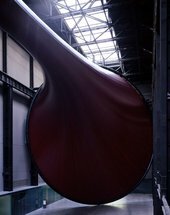 Anish Kapoor was born in Bombay in 1954.